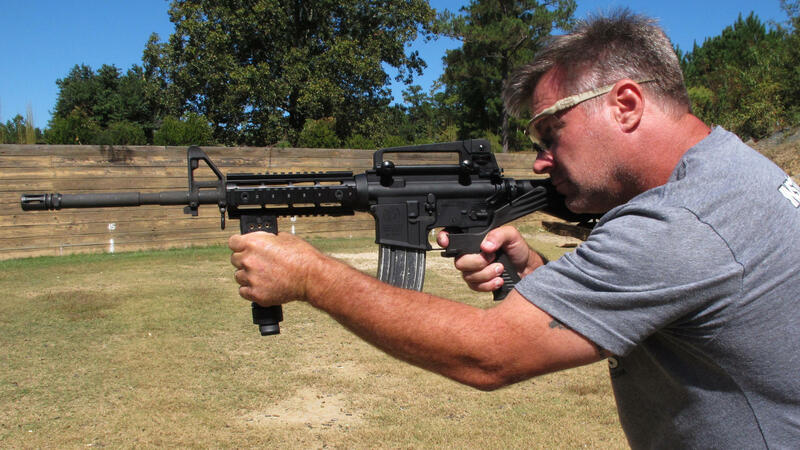 Shooting instructor Frankie McRae aims an AR-15 rifle fitted with a "bump stock" that allows the semi-automatic to shoot as fast as an illegal machine gun. As of March 26, bump stocks will be effectively illegal to own unless a court puts an injunction on the federal ban. There's a countdown clock on the website for RW Arms, a Texas-based seller of firearms accessories. It tracks the days, hours, minutes and seconds until they're no longer permitted to sell bump stocks, devices that allow semi-automatic rifles to fire almost as fast as illegal machine guns. Promotional emails from RW Arms also include the countdown clock, urging customers to "order now" to "enjoy this unique firing experience" while they can. RW Arms promotional email sent in January to prospective customers. Bump stocks are mostly a novelty, used by people who want to experience firing a gun at machine-gun speeds. But in 2017, a gunman used bump stocks to fire into a crowd in Las Vegas, killing 58 people and injuring hundreds. The incident caused the administration to reexamine the legality of the devices, and in December it announced the ban. RW Arms' sales pitch does not dwell on the fact that, by March 26, its customers will have to destroy or hand in any bump stocks they buy. In fact, no bump stocks will be "grandfathered in." The new federal rule reclassifies them all as "machine guns," no matter when they were purchased, and owning one will become a felony. But it's anyone's guess how many people will dispose of their bump stocks. About half a million of the devices have been sold since 2010, and so far relatively few have been turned in to authorities — even in the handful of states that banned them before the federal rule came out in December. One reason may be a lingering hope that the ban will be reversed. Gun rights activists have filed several lawsuits, accusing the government of bowing to political pressure when the ATF reversed its earlier findings that bump stocks were legal. Tim Harmsen is a bump stock owner and one of the plaintiffs in a suit filed by Gun Owners of America. "The issue for me is government overreach," he says. "The executive branch just said, 'Hey, we want you, basically ATF, an agency, to rewrite, reinterpret federal law so that we can get the outcome we want.'" Harmsen is a firearms expert with a social media following and YouTube channel. He says he's not about to encourage anyone to break the law, but he predicts some people will, as they did with earlier bans on extended ammunition magazines. "We have all sorts of people historically, when things like this happen, that just turn to peaceful non-compliance, and I think you may see some of that as well in our community," Harmsen says. The lawsuits also object to the fact that the new rule effectively deprives people of their property — bump stocks cost anywhere from about $180 to $500 — without compensation. "ATF has given 90 days here to either turn in your bump stock, or smash it with a hammer and throw it away," says Rob Olson, the Gun Owners of America lawyer. "Every day that we tick closer to 90 days the average gun owner is going to not want to run the risk," he says, as people feel growing pressure to get rid of the devices. Olson hopes to relieve that pressure by getting a preliminary court order suspending the ban — and the countdown to March 26. The ATF would not comment on why the new rule delays implementation of the ban for 90 days. The agency referred NPR's questions to the Department of Justice, which didn't reply to requests for an interview. Former ATF officials say it's customary to include a 30 or 60-day implementation period on a ruling like this, but they say it's unusual for the agency to allow the continued sales of a firearm accessory that will soon be illegal to own. RW Arms would not agree to an interview with NPR, but it emailed a response to the question of whether its customers were buying bump stocks with the understanding that they would have to get rid of them by March 26. "We cannot speak on behalf of our customers. Certainly there are customers who are disappointed with the move to ban bump stocks. However, we do not have any indication as to what they will do should the ban take effect on March 26th, as planned. RW Arms will fully comply with the law, and we are prepared to direct our customers to do the same." Joe Vince is a former ATF special agent, now a consultant on gun crime analysis. He believes the agency included a 90-day delay in implementation "because the gun lobby is so powerful." He says ATF enforcement has been hollowed out, and people who keep their bump stocks are unlikely to be caught. But only if they're quiet about it. Vince says they'd be ill-advised to shoot with their illegal bump stocks in places where someone else might hear them. "If you go to use this, and somebody says, 'Nah, that's not semi-automatic fire, that's fully automatic,' there's going to be somebody out there to check on it." Many people first heard the term bump stocks after the Las Vegas mass shooting in 2017. The gunman used the devices to fire his rifles faster - almost as fast as illegal machine guns. In December, the Trump administration announced a regulatory ban on bump stocks after a three-month grace period. As NPR's Martin Kaste reports, the sellers and buyers of bump stocks are making use of that extra time. MARTIN KASTE, BYLINE: Texas-based RW Arms is one of the best-known sellers of bump stocks. And if you go to their website right now, you'll see they have a countdown clock to March 26. That's the day this ban actually takes effect. They're also putting that countdown in their marketing emails, encouraging their customers to buy bump stocks while they still can. JONATHAN LOWY: It's remarkable and outrageous. KASTE: That's Jonathan Lowy with the Brady Center to Prevent Gun Violence. He's co-counsel on a post-Las Vegas lawsuit against the makers and sellers of bump stocks. LOWY: Not only do they keep on selling them, but they're apparently using their illegality to try to sell more of them. KASTE: To be clear, under federal law, bump stocks are not yet illegal. That happens on March 26 when it will become a felony to own one, even one that was bought legally right now during this 90-day period. Former ATF officials say this is an unusual situation, the fact that the government is allowing dealers to keep selling devices that their customers will soon be required to give up. But the question is, when that deadline comes, will they give them up? TIM HARMSEN: (Laughter) Well, if you're asking me if I'm going to break the law, of course, I'm not going to go on national radio and say I'm going to break the law, nor would I tell other people to break the law. KASTE: Tim Harmsen owns a bump stock. He's a firearms expert in Indiana. He has a YouTube channel and a following on social media. He says gun enthusiasts are not happy about this ban, and some of them may resist it. HARMSEN: We have all sorts of people, historically, when things like this happen that just turn to peaceful noncompliance. And I think you may see some of that as well in our community. KASTE: But Harmsen hopes it won't come to that. He's a plaintiff in one of a handful of lawsuits against the federal ban. They generally accuse the ATF of improperly reversing its earlier rulings, which had allowed bump stocks. They also object to the government effectively confiscating property without compensating the owners. Bump stocks cost about $200. Harmsen's suit was filed by a group called the Gun Owners of America. Lawyer Rob Olson says they're hoping for a preliminary court order that would put the ban on hold and take some of the pressure off people who are trying to decide what to do with their bump stocks. ROB OLSON: ATF has given 90 days here to either turn in your bump stock or smash it with a hammer and throw it away. And every day that we tick closer to 90 days, the average gun owner, you know, is going to not want to run the risk. KASTE: About a half-million bump stocks have been sold since 2010, mostly as novelty items. There's no way to know how many of them are still out there or how many have been disposed of. In states that had earlier bans, police say relatively few bumps stocks were ever turned in to them. And as to RW Arms, the company would not do an interview about its countdown sale. But in an email to NPR, it said, quote, "certainly, there are customers who are disappointed with the move to ban bump stocks. However, we do not have any indication as to what they will do should the ban take effect on March 26 as planned. RW Arms will fully comply with the law, and we are prepared to direct our customers to do the same" - unquote. Martin Kaste, NPR News. Transcript provided by NPR, Copyright NPR.